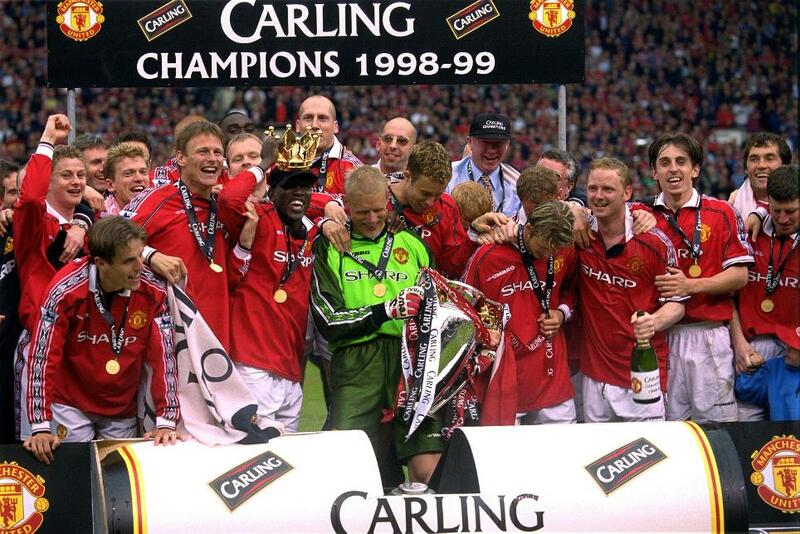 In the last full season before the turn of the Millennium, history was made as Manchester United became the first English club to win the Premier League, FA Cup and UEFA Champions League treble, and their fate in all three competitions was sealed during an incredible 10-day period in May 1999. The first of an unprecedented trio of trophies was the Premier League title. After locking horns with Arsenal and Chelsea throughout the campaign, the Gunners fell short by just one point as Andrew Cole sealed a comeback victory for Man Utd against Tottenham Hotspur at Old Trafford on the final day. The gripping finale followed a campaign full of landmark moments, as the Premier League Academy system was set up, England got three Champions League places for the first time and the Premier League's turnover rose to £281million. In the summer of 1998, Man Utd looked to bounce back from Arsenal's maiden Premier League title triumph with the additions of Jesper Blomqvist, Dutch centre-back Jaap Stam and Aston Villa striker Dwight Yorke, while Gianluca Vialli brought Marcel Desailly to Chelsea after he starred in France's 1998 FIFA World Cup triumph. Another shining light in the summer's World Cup was 18-year-old England forward Michael Owen, and he hit the ground running on his return with a hat-trick for Liverpool, under the stewardship of Roy Evans and newly appointed joint-manager Gerard Houllier, as they beat Newcastle United 4-1 in Ruud Gullit's first match in charge at St James' Park. In September, Christian Gross was the next manager to depart and he was replaced at Spurs by George Graham, who had led his Leeds United side to a thrilling 3-3 draw at White Hart Lane in his last match before taking over. Spurs finished 11th and won the League Cup final, with the dazzling form of winger David Ginola recognised with the Professional Footballers' Association and Football Writers' Association Player of the Year awards. 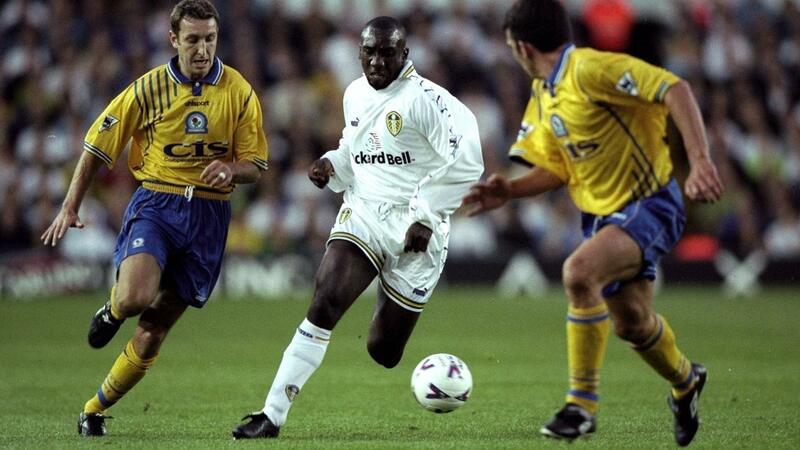 Meanwhile, David O'Leary made the step up from assistant to manager at Leeds and guided them to a fourth-place finish, with striker Jimmy Floyd Hasselbaink the Premier League's joint top scorer, alongside Owen and Yorke, with 18 goals. Villa compensated for the loss of Yorke by recruiting Dion Dublin and Paul Merson, and they flourished under the tutelage of John Gregory, spending much of the first half of the season at the top of the table. Dublin's double helped them beat Arsenal 3-2 at Villa Park in December, but a 10-match winless run at the turn of the year took them out of the title race. Villa's poor form in 1999 and a difficult winter spell for Leeds meant the title race was between Manchester United, Arsenal and Chelsea. After losing their opening match at Coventry City, Chelsea went on a 22-match unbeaten run before Dennis Bergkamp's goal for the Gunners consigned them to their second league defeat in January. Man Utd came to the fore and five successive wins put them in the ascendancy in February. In one of those successes, Ole Gunnar Solskjaer scored four goals in 14 minutes after coming on as a substitute as they thrashed Nottingham Forest 8-1 at the City Ground, the biggest away win in Premier League history. Man Utd remained unbeaten for the rest of the campaign but only one defeat apiece for Arsenal and Chelsea during that time took the title race down to the wire. Steve Guppy's stoppage-time leveller for Leicester City at Stamford Bridge landed a damaging blow to Chelsea's hopes, while Liverpool held Man Utd to a 2-2 draw on the same weekend. Arsenal's 1-0 loss to Leeds in their penultimate match of the season and a 0-0 draw for Man Utd against Blackburn Rovers, who were subsequently consigned to relegation four years after being crowned Premier League champions, meant Sir Alex Ferguson's side were one point ahead of the Gunners going into the final day. Arsenal won 1-0 against Villa but their north London rivals Spurs were beaten at Old Trafford despite going in front through Les Ferdinand. 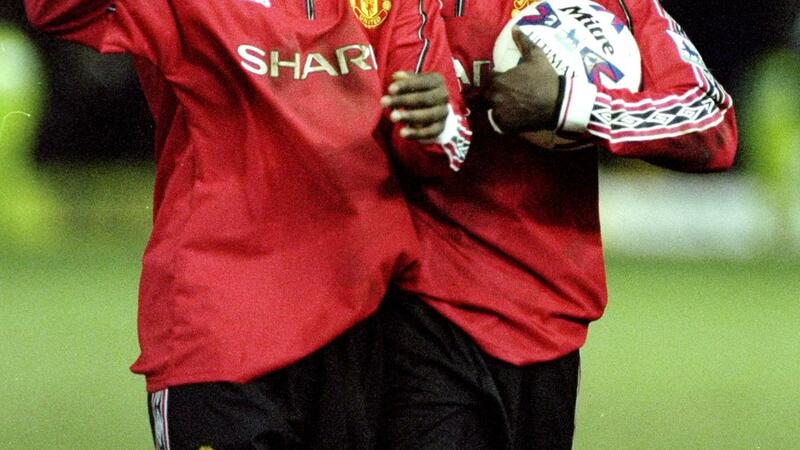 David Beckham fired in a brilliant equaliser and Andrew Cole's perfectly executed chip sealed Man Utd's title. A few days later Teddy Sheringham fired the Red Devils to an FA Cup final win against Newcastle and then a sensational stoppage-time comeback in the UEFA Champions League final against Bayern Munich made United first English club to win the prestigious trio of honours in the same season. There was no shortage of drama at the bottom of the table either, as ever-present Premier League clubs Everton and Southampton staged remarkable run-ins to avoid relegation. Kevin Campbell joined the Toffees on loan from Turkish club Trabzonspor in March and netted nine goals as they won four of their final six matches, while Southampton climbed out of the drop zone for the first time all season in May. They won their last three matches, with talisman Matt Le Tissier scoring direct from a corner in a crucial win at Wimbledon. Saints' final day win over Everton consigned Charlton Athletic to relegation in their first PL campaign. Blackburn went down despite the efforts of Brian Kidd, who had taken over after leaving his role as Man Utd assistant manager, and Nottingham Forest finished bottom.